The SCCJR is pleased to announce its 2017 PhD Poster Competition. The competition, open to SCCJR PhD candidates in their second, third and fourth years of study, gives our researchers an opportunity to showcase their work in creative and novel ways. The winner and runner-up will each receive a cash prize. The deadline for entries is Tuesday, February 28th. For information on how to enter, please view: PhD Poster Competition Guidelines 2017. See below for the stand-out entries in last year’s competition. Emiline Smith, University of Glasgow: ‘Cultural Property in Transit: A Case Study of Hong Kong’. 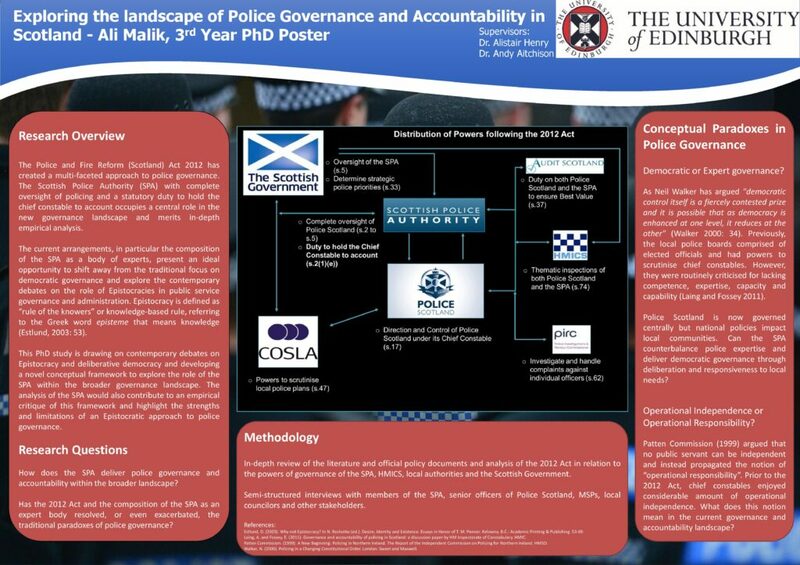 Ali Malik, University of Edinburgh: ‘Exploring the landscape of Police Governance and Accountability in Scotland’.